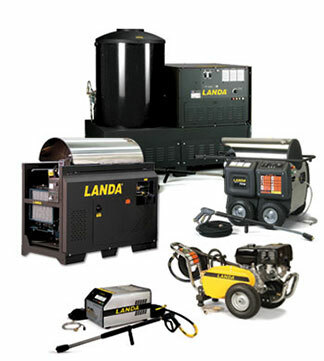 As your local Landa pressure washer dealer, we offer you Landa’s industrial-strength equipment and accessories to help you clean the toughest jobs. Landa has been a premier manufacturer of commercial-grade pressure washers for more than 40 years. Landa is one of the first power-washer companies to meet internationally recognized ISO-9001 standards for quality manufacturing and to certify its equipment to the rigid UL-1776 safety standards. Our Landa pressure washers are backed by patents, awards and a top warranty program. The workhorses of cleaning, our Landa power washers come with commercial-duty direct drive or belt drive pumps backed by 7-year warranties, 1-1/4 inch steel tube frames, unrivalled parts and accessories, and all of our power washers are ETL certified to UL and CSA safety standards. There’s only one way to clean effectively and economically, and that’s with our Landa pressure washers - hot or cold, electric or gas powered, mobile or stationary unit. Don’t forget to also ask us about our Landa environmentally friendly detergents.